Arrive Dalaman airport 21:45, obtaining a visa (GBP10/Euro 15) and passport control take time. Arrival duty free shop is disappointing, but the taxi proves reliable. Leave airport 22:40 and arrive, after some Balkan style driving, at Netsel marina, the base of our charter boat, by midnight. Despite the late hour the staff at Sunshine cruising is awaiting us and provides a warm welcome; we are even offered a light meal at the restaurant near the pontoons. Kimberley, a Rodman 41, is presented polished and gleaming as new. Our charter officially starts Saturday but due to the boat not being used the previous week we are allowed to spend Friday night on board. Roaring discos are noticed in the distance in Marmaris town. 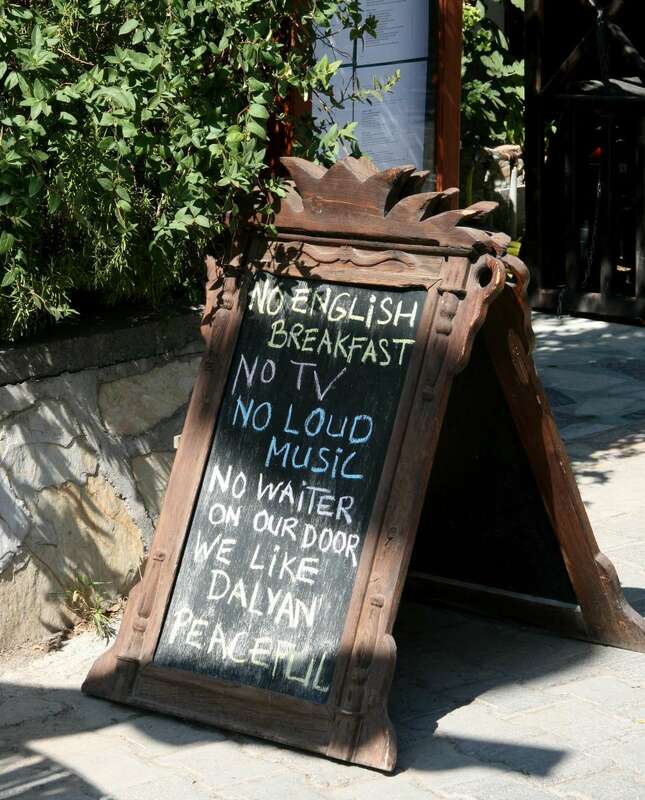 We hear that tourism generally is not that good in Marmaris in these days, was better once. Maybe Marmaris has grown too big (yes, I must agree! ), but yachting tourism was not affected. After checking our luggage into the boat we retire at about 2am. Breakfast and checking out the boat; lengthy boat briefing by Ahmet, the helpful Sunshine boss (very well meant but not always easy to follow), then food shopping. A guided test/demo drive starts at about 2pm; obviously, this is a test of our skipper's skills, too. Fair enough! Finally, by 3pm we head out of Marmaris; going slowly across the bay we open the throttles once outside, about 22kn is comfortable towards Kadira Burnu where we meet wind and swell from SW. The meltemi is blowing at 4-5bf; concerned about the fly-bridge canopy's stability we throttle back to 9kn; decide to go to Ciftlik cove for the first night instead of Bozuk Büku further down the coast. 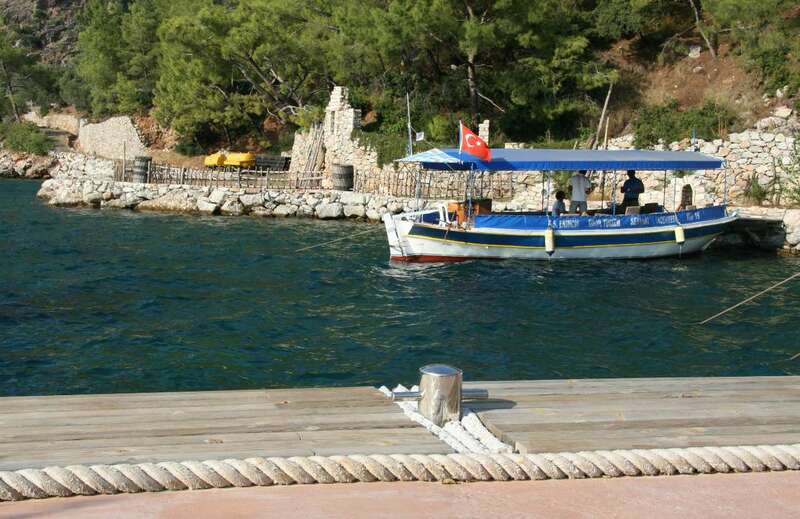 We find most of the restaurant jetties empty, and the staff waving to invite to berth; we decide for the simple looking Mehmet restaurant pier berthing stern to with a mooring. Jane's a bit hasty when mooring, leading to a small bruise on her arm but nothing serious. Friendly people around; there are 4 other yachts, two of them older type boats owned by Germans. The rocky cove looks more pleasing than we had expected; there is only one, not too huge, hotel to be seen in the distance; the large restaurant (Club Fanya?) in the S corner does not have business.We have heard that people experienced problems here in heavy weather, but in our case it looks perfectly safe. Meal at Mehmet's (at TRL 76 for two) included starters, meat mains, bottle of very drinkable wine and coffee, and free mooring. 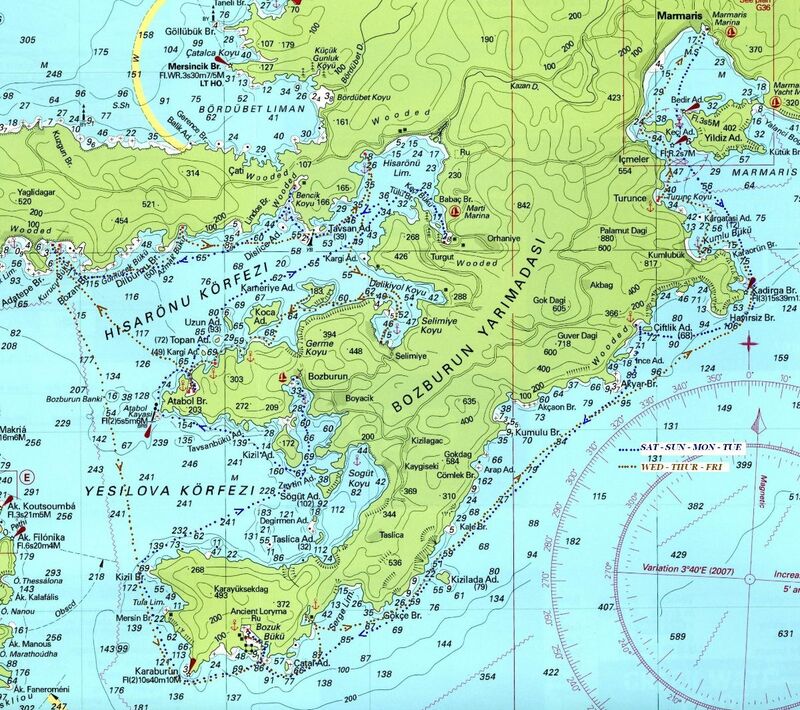 First stop is Bozuk bay, ancient Loryma, an interesting large bay; we anchored near NW corner with good holding. Using the dinghy to explore the bay and get nearer to the fortress, the outboard stopped working. We row back (exposing ourselves a bit more to the sun than we had expected). We decide to go to Bozburun harbour for the night to meet Fatih, the helpful and capable service guy from Sunshine to look after the engine. The yacht quay on the West side is full with some gulets and yachts but the quay in front of the restaurants and bars is almost empty; we go stern to with an anchor. Bozburun is a pleasant fishing harbour; there is a harbour fee of TRL 40 for our boat, but it is possible to anchor outside for free. Right across from our berth is Safak's Place, where we have a nice dinner. Thankfully the restaurants close at around 11pm restoring peace for a good night's sleep. After using the toilet in the morning I discover an embarrassing flow of some waste water from the boat. I can only conclude that the holding tank must be full, despite the gauge reading empty; we later verify the defect gauge which obviously had led to the boat being handed over to us with a nearly full waste tank. From Bozburun we head South past Kizil Ada and West and around the Atabol headland to Dirsek cove for a swim and lunch stop. The anchorage in the Eastern part appears to have dodgy holding ground. There is a restaurant with jetty in the South West corner. We try out the dinghy but unfortunately the engine stops again and I cannot get it to work, so it's rowing time. In the afternoon the Meltemi gets up as usual and blows across the bay from the West, but going East towards Keci Bükü and Orhanyie makes for an easy ride. 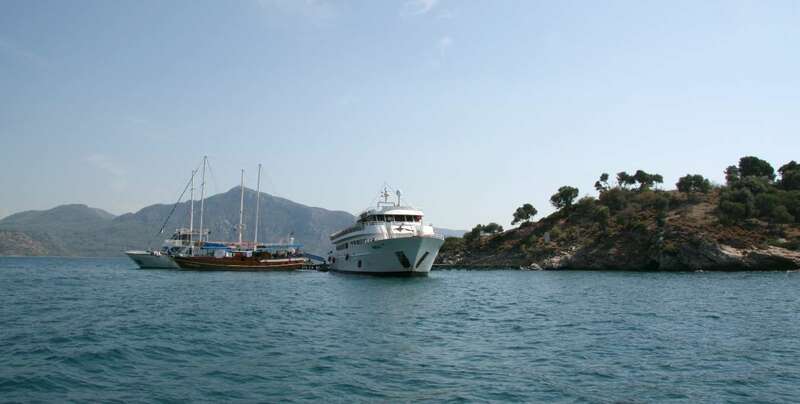 Martti Marina looks big and busy, we give it a miss and go further to the S of Keci Bükü, past the sand bar. Mooring alongside the jetty of the small Ersoy restaurant in SE corner of the bay, a pretty setting and looks over the bay. There are even ducks. In the evening helpful Fathi from Sunshine visits again, checks the outboard – and finds the fuel shut-off partially closed (it's an inconspicuous plastic lever on the side, only marked “open”). So, it was handling mistake, this call-out could have been saved. 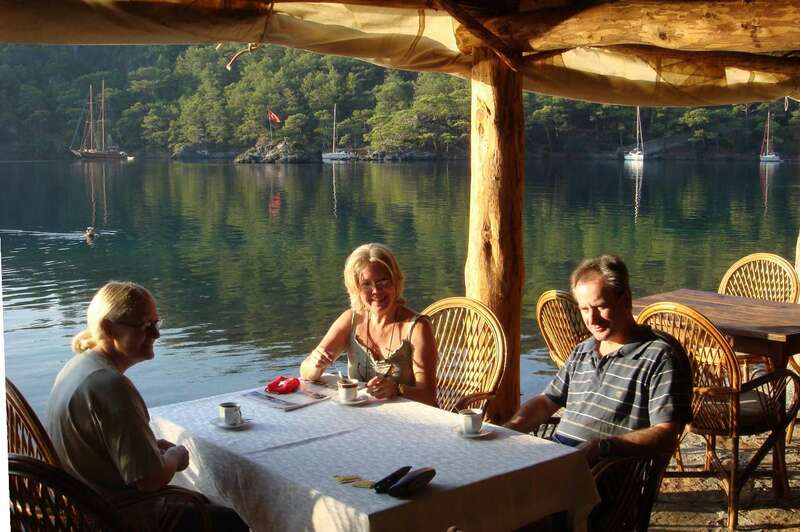 We have a good dinner of traditional cooking at Ersoy's, excellent value at TRL 66 for a large meal and free mooring. Several locals dine here as it is approachable by car. Jane is worried about mosquitoes. Generally there does not seem to be much business yet, nearly half of the mooring space still available. I can just about pick up a weak signal from the free Wireless Internet of Martti marina across the water. 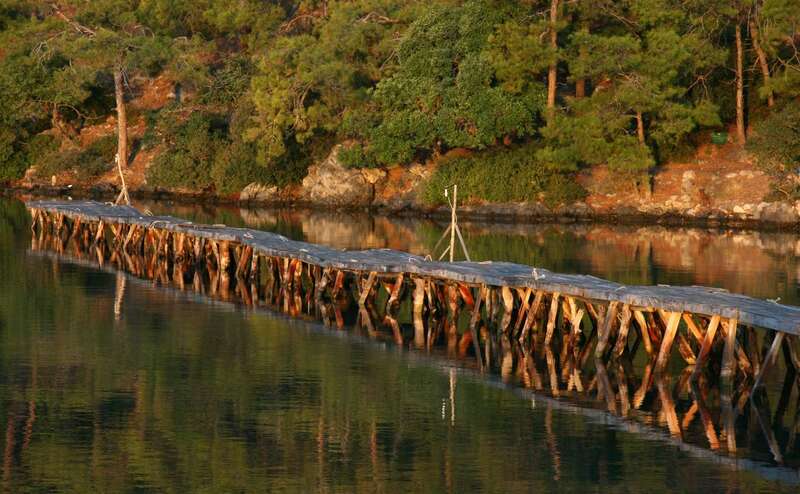 Ersoy restaurant jetty in Keci Bükü, Orhanyie. Martti Marina across the bay. 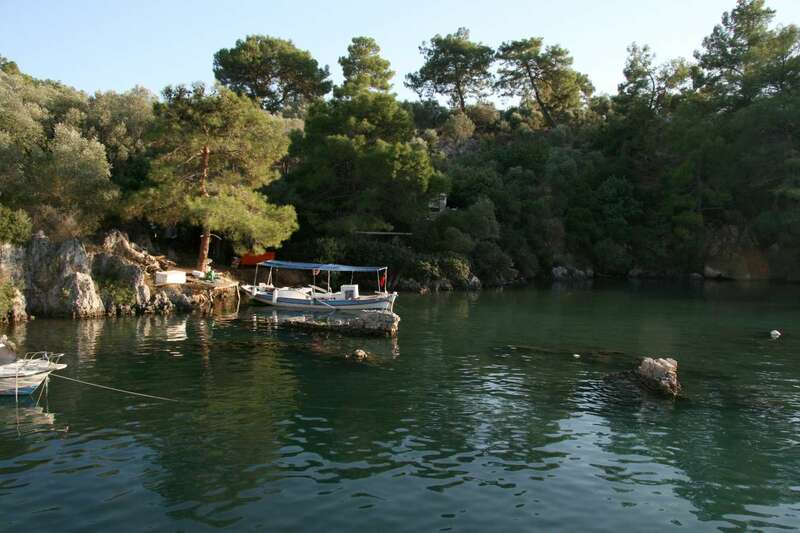 On our way out of Orhaniye bay and West we visit Bencik cove, a very pretty wooded cove which is well known locally. It is a long inlet but quite narrow in places so we anchor with a stern line to shore. A local guy who trades from his small boat comes along and offers help getting the line ashore, which is gladly accepted as there are only two of us on-board. There are some rocky ledges in parts of the cove, so care has to be taken not to get too close to shore. 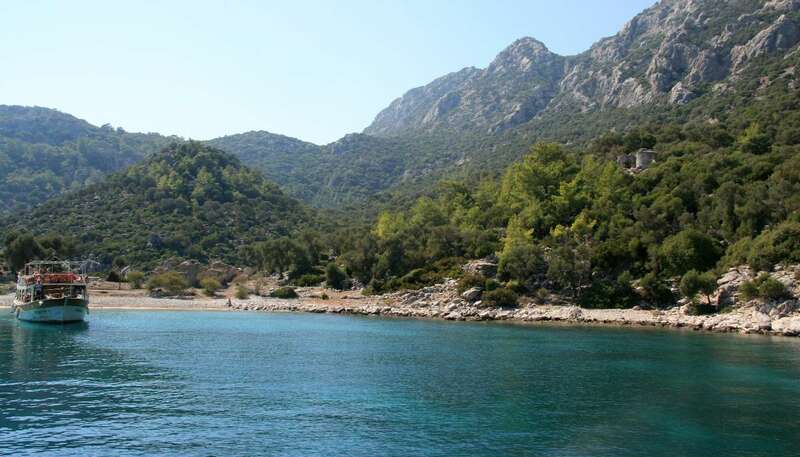 After a good swim and lunch we leave for Kuruca Bükü (Kochini bay) where we have agreed to meet friends and join them in their house in Datca Aktur, the holiday village next to the bay. We anchor in front of the beach at 10meters. 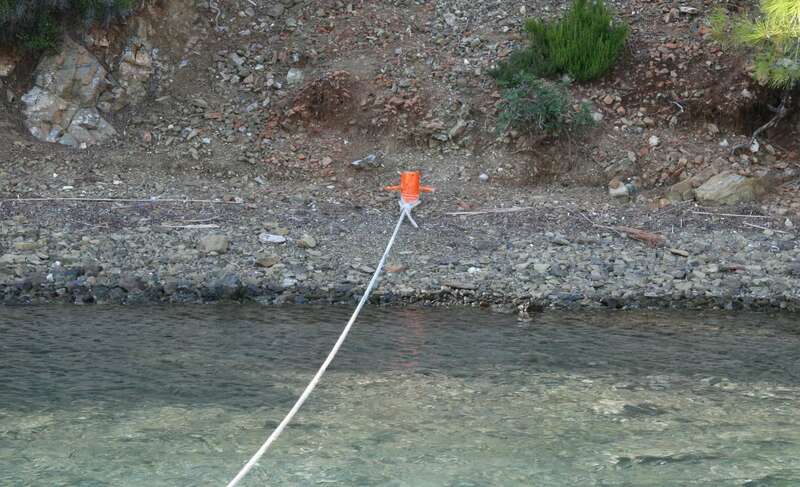 At that time there are no buoys, but we spot some rope ends in the water coming from the ground which are probably used for buoys during the holiday period. Careful navigation is advised. We enjoy hospitality at our friends' house, where Sevket's mother has prepared a delicious meal. We spend the night at anchor in Kuruca bay. We are taking our friends Catherine and Sveket on board for a couple of days, and leave for an exploration of bays. We start with Azmak Bükü just to the East of Dilburnu , a shallow swimming bay with palm trees, which apparently cannot be reached by road. It offers reasonable holding ground. Next we visit Kuyulu Bükü further to the East into Hisarönü Limani, and anchor in the most Northerly of the two anchor coves, near its South end. The water is muddy, and on the first attempt the anchor only picks up weeds and mud, but a bit further North it's then ok. Interesting slopes with red soil and pine trees. For the evening we head South, across and into the bay towards Selimiye, where we choose the well known Sardunya restaurant for dinner and overnight. This has been described as a large fish restaurant with high standards, and we are not disappointed. The pontoons are sophisticated, too, they provide not only water and electricity but deckchairs, steps into the water and showers. I am surprised by the short twilight period at this Southerly latitude, the sun seems to set faster than expected. We start the day exploring the surrounding coves and islets in completely calm seas, as always in the morning. We pass through the channel between the mainland and Kameriye Ada, looking at the remainders of an old monastery on its South side. We find it difficult to anchor off this island, although, it seems, gulets do it. We continue West leaving Koca Ada to starboard. The scenery is very pretty but the bays around this island are often unsuitable for anchoring, quite deep or too small, maybe local knowledge would help. We set anchor in a small bay opposite Kargi Ada for a short stop and swim, and then go on to Dirsek where we anchor towards the South West end for lunch. Then it's time to take our friends back home to Kurucu Bükü, where we arrive around 3pm. 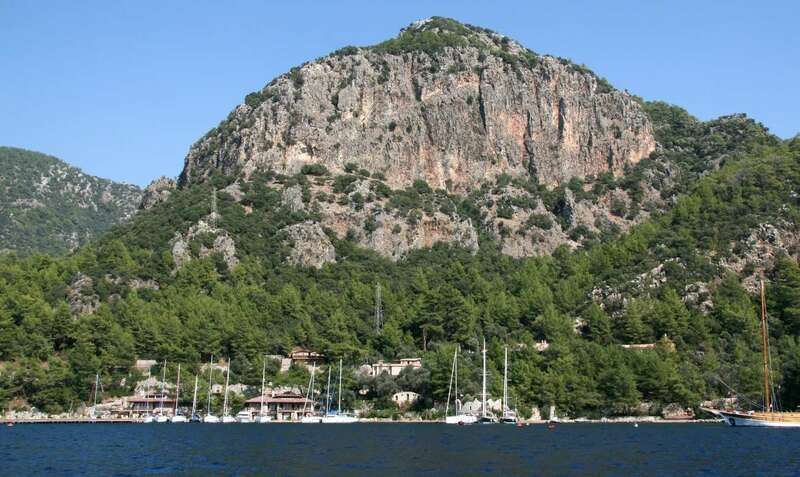 The next day will be the last of our cruise, so we want to stay overnight closer to Marmaris. We cross the Hisarönü Köfezi (Hisaronic gulf) to SE. The island of Simi to starboard offers protection from the meltemi; we use the power of the boat for a fast yet comfortable ride past Kizil Burnu and round the headland at Karaburun with its lighthouse. 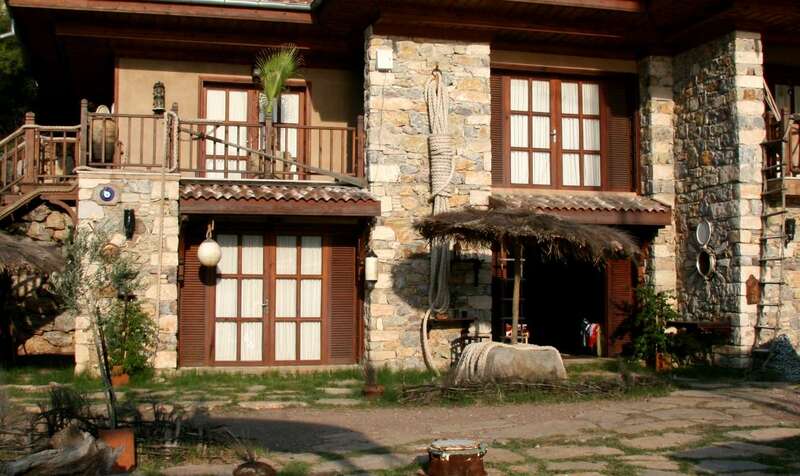 This night we stay at Bozuk Bükü, there are three restaurants and we choose the simple looking Sailors House. The people are very friendly, but the food is average and the price for dinner for two of TRL100 is on the high side compared to others we had before. 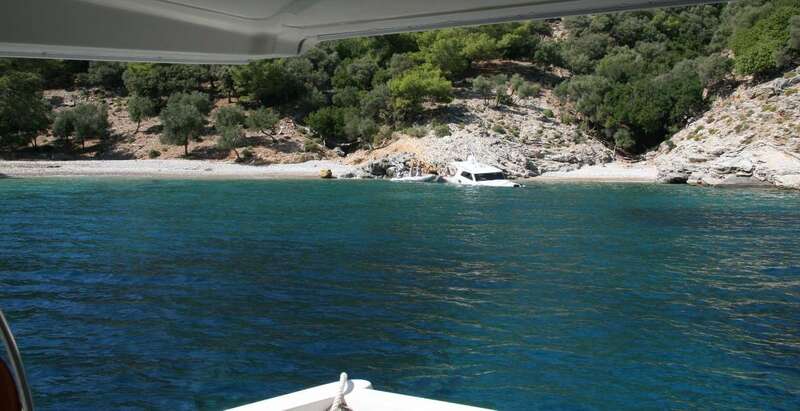 Maybe the reason is lack of road access to this cove, or maybe it's just very popular with yachting folks and gulets? No electricity or water available, anyway this is no issue to us. 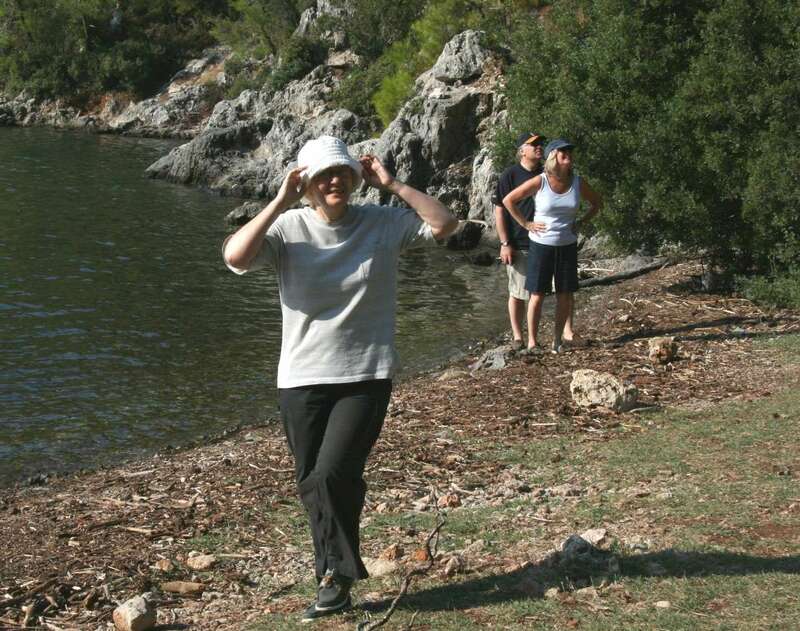 In the morning we explore the bay on land, but find walking difficult due to rocky grounds and no paths. 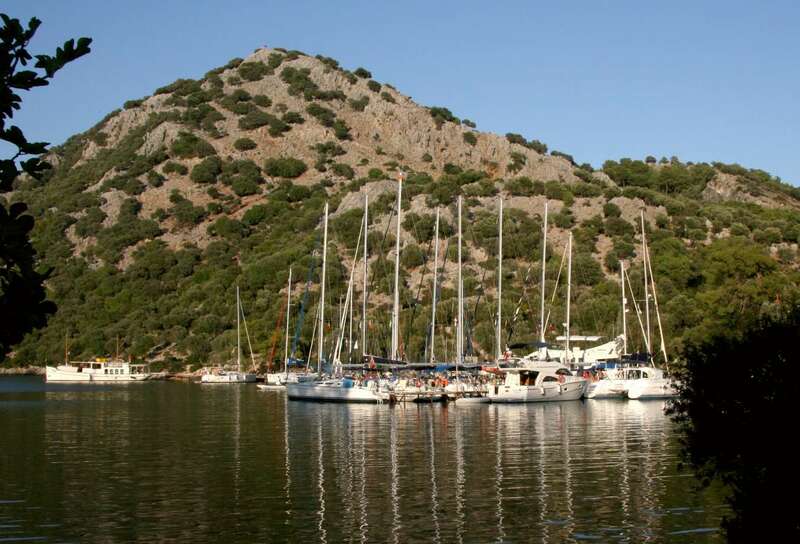 On the way back to Marmaris we have a brief look into the rocky cove Serce Koyu which appears to be a protected anchorage with mooring buoys to restaurants in the Northern part. Going further NE, past the Kadirga Burnu headland and closer to Marmaris, we try to anchor in Kumlu Bükü, a large bay, partially built up. Gulets have taken the spaces in the SE corner in front of wooded slopes using shorelines; further South and Centre there does not appear to be good holding ground, but there is a hotel with a jetty. The anchor picks up rubbish. 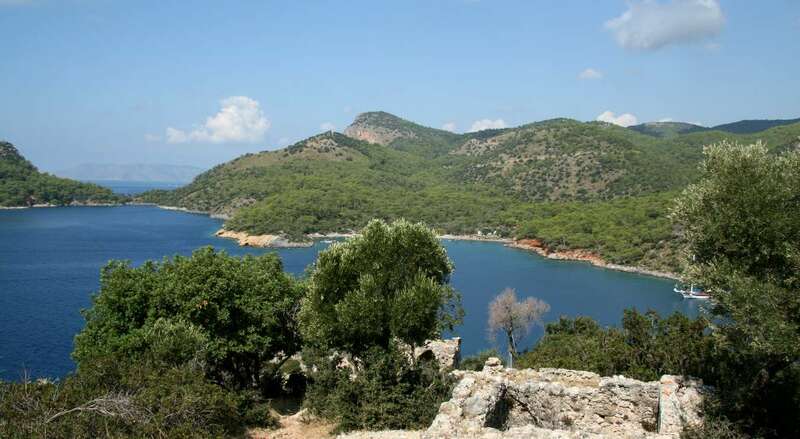 We don’t find the placed inviting and move up North to Turunc Bükü, a built up bay, with a large hotel and beach occupying the South corner which once would have been an anchorage. In the West is a busy quay for trip boats, we anchor in some distance in front of it and, over lunch, watch the hustle and bustle of coming and going trip boats and water activities. After lunch we leave for Marmaris. Crossing the wide bay, the sight of bleak concrete hotels all along the Western shores up to Marmaris town is not attractive; the Eastern and Southern sides of the bay have luckily been spared from such development. 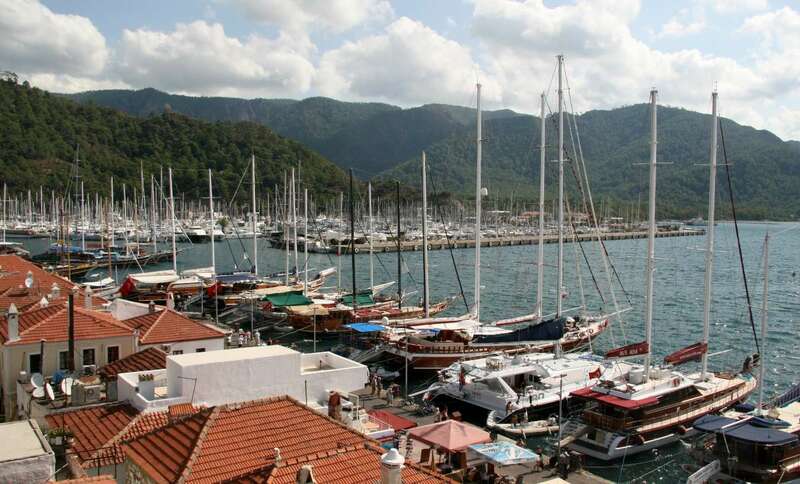 Marmaris town quay is overflowing with gulets; we arrive at the Marina fuel pontoon at 4pm. Refuelling and handing back the boat goes smoothly; by 7 pm we get into the taxi to catch a late evening flight to London. Crew: Jane and Wilhelm. On Wednesday and Thursday joined by Catherine and Sevket. Boat: Rodman 41 flybridge motor yacht (LOA about 13.5m/44ft, 2x 430hp Diesel engines), chartered from Sunshine Cruising at Marmaris. 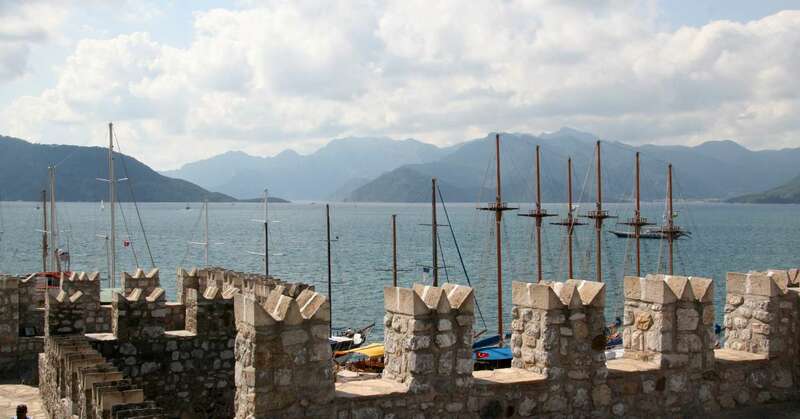 It was our first cruise on the Turkish coast; the purpose was to explore this part of the Mediterranean and to meet friends who own a holiday home in the region. 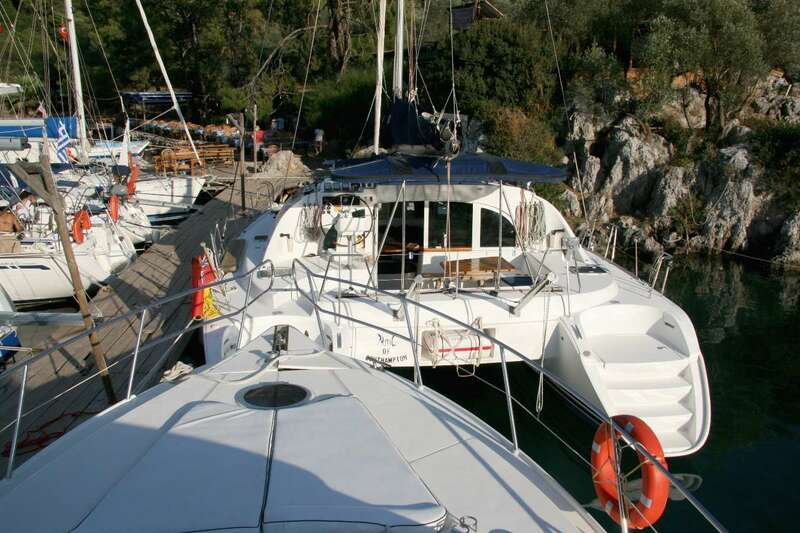 Yachting in Turkey seems mainly based on sailing yachts and the ubiquitous (skippered) gulets. Gulets do not seem to use the smaller restaurants for overnight stays so there does not appear to be too much conflict or fighting for spaces. However, several anchorages are occupied by gulets, and there must be more in high season. 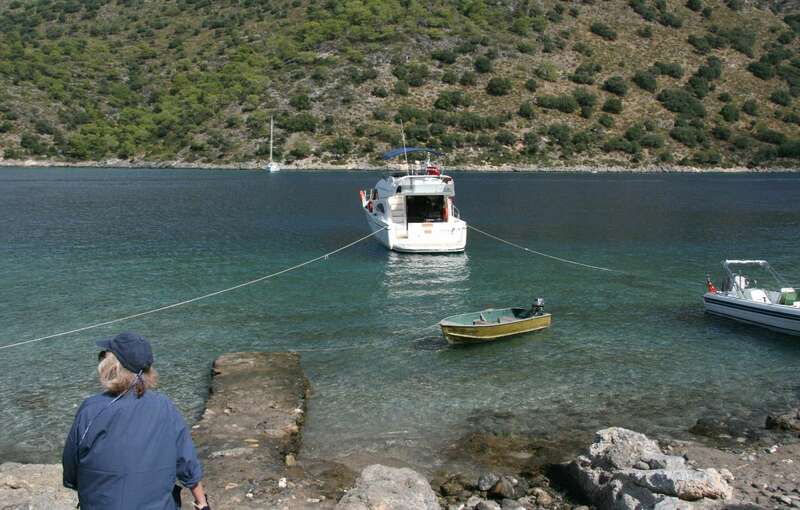 Our boat was usually the only motor-yacht among sailing yachts on jetties; Diesel fuel prices in Turkey are high, at Marmaris we paid TRL 3.36 (£1.41) per litre. 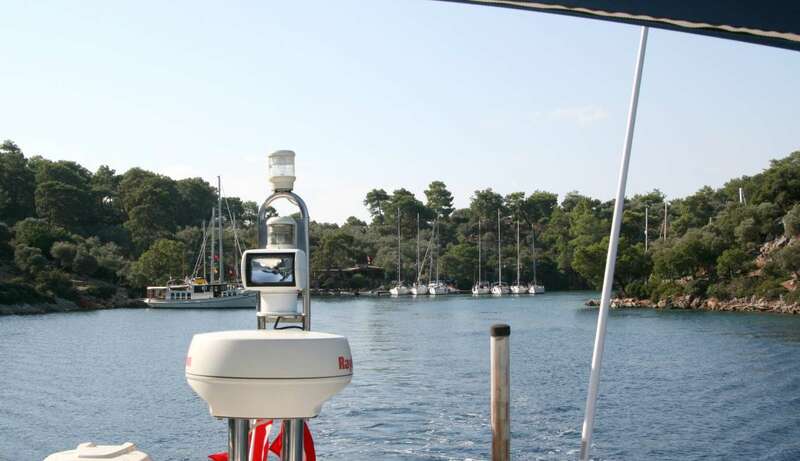 However, climate, wind conditions and coast line are very suitable for motor cruising. We were lucky and had warm sunny weather with blue skies all week. Day time high temperatures around 30 deg C, rising towards the end of the week; night low temperatures around 20 deg C. The only few drops of rain we saw were inland when going back to Dalaman airport. Always be aware and protect yourself against the strength of the sun. WIND : The meltemi got up regularly around lunch time, reaching its maximum at 4 or 5pm in the afternoon and dying down in the evening around 8pm allowing for calm nights. In the middle of the week it was stronger, about 5 bf, less towards the end. In our cruising area it raises a Westerly swell following the coast lines, which can cause an uncomfortable ride and spray if going against it in the later afternoons. We found the local people, in particular the restaurant people who double as marinaios during the day, very helpful. The food was usually good and reasonably priced, with fresh salads, vegetables and fruit. It is generally more based on meat than on fish, we noted that some fish is farmed in the area which makes for poor quality. The white wines we tried were simple but dry, and better than we had expected from descriptions. I was concerned about the quality of the tap water, so we only used bottled or chlorified water. We did not experience any digestion issues; maybe my concern was unnecessary. Crew: Jane, Wilhelm. At Göcek on Wednesday join Catherine and Sevket. 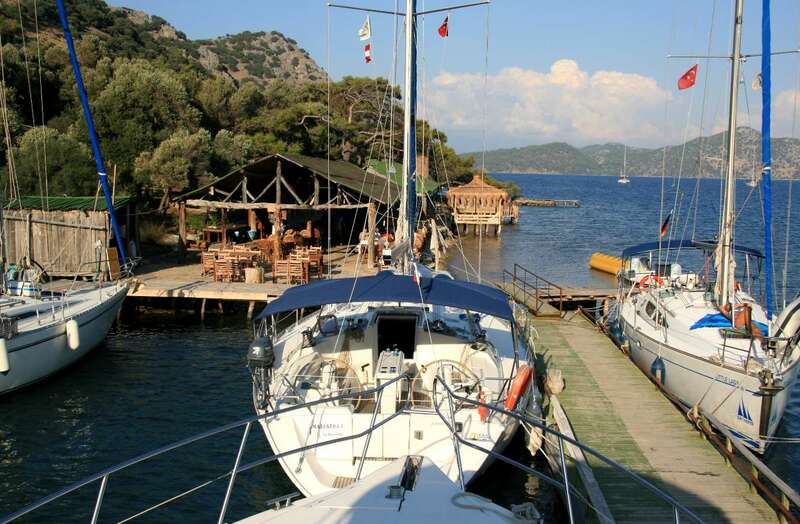 We arrive at Dalaman airport late evening and take a taxi to the Marmaris Netsel marina. Friendly welcome by the team of our charter company. We are allowed to sleep aboard this night, our charter starts the next morning. We take the boat over; as we are customers returning to the same boat this goes without introduction formalities. The weather forecast is for calm settled weather during the next days. I have been to Caunos on a land based holiday many years ago, we are now interested to do the Dalyan river tour from the sea: The most practical way is by hire boat from Ekincik, and Mymarina is the best place to stay and start from. 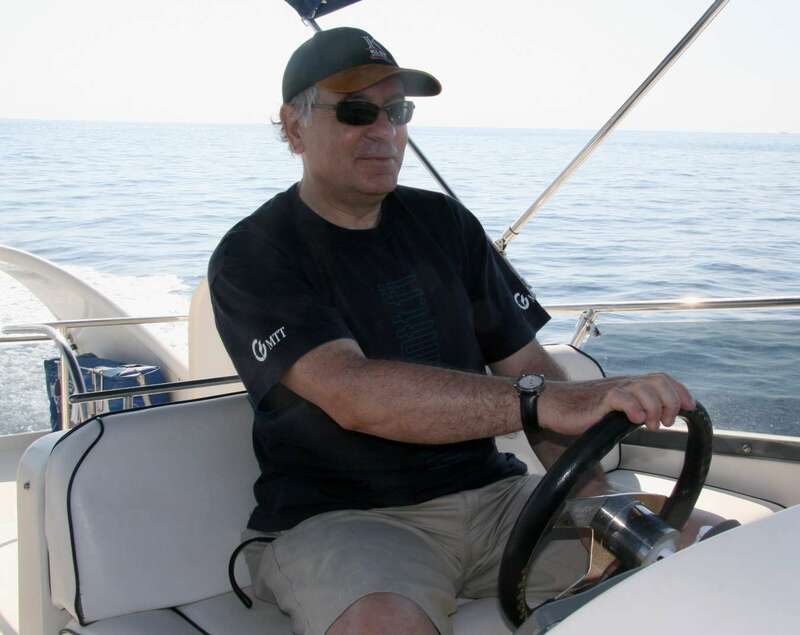 So we leave Marmaris harbour and turn E, steering a course to the South of the Turnali Kayasi buoy and Yalincik island, to give the prohibited Karaagac bay area a wide berth. 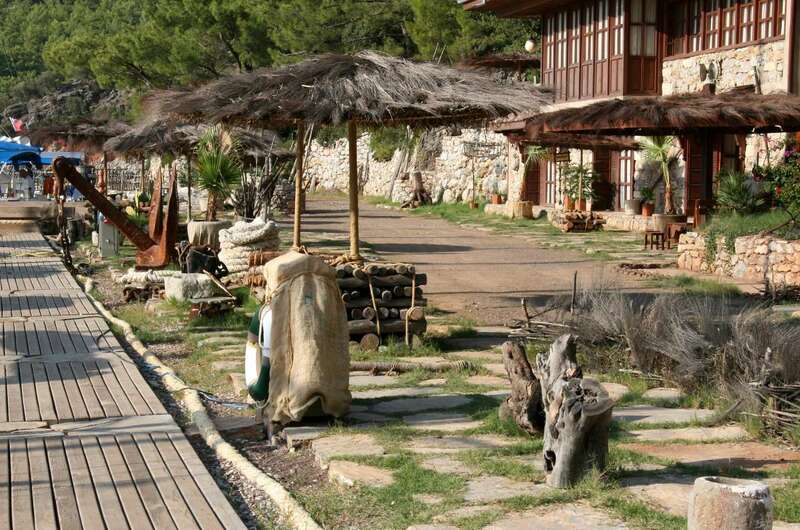 Mymarina is an amazing place, quasi a "boutique" marina with a lot of attention to design details and fancy landscaping including a fake antique ruin. On their T-jetty they offer electric power and water, but boat washing is prohibited. The large restaurant above, though not cheap, has a high standard, too. MYMARINA, UPMARKET AND UNUSUAL DETAILS. COVERED POWER AND WATER POINTS; NEED A LENGTH OF ROPE ? 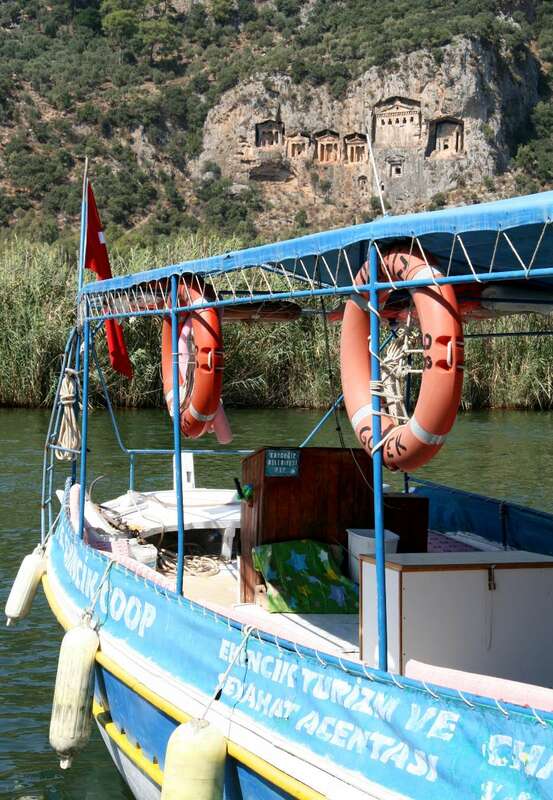 The Dalyan river and Caunos tours by trip boat are organized by the Ekincik cooperation, who appears to have a monopoly. The services are well organised and safe but prices and choices are dictated by the coop. If you want to save money you can talk to other boaters and agree to form a small group before booking a trip boat. Öz Ekincik Tourism Coop, Tel. +90 0252 266 0192 GSM +90 532 331 5964. 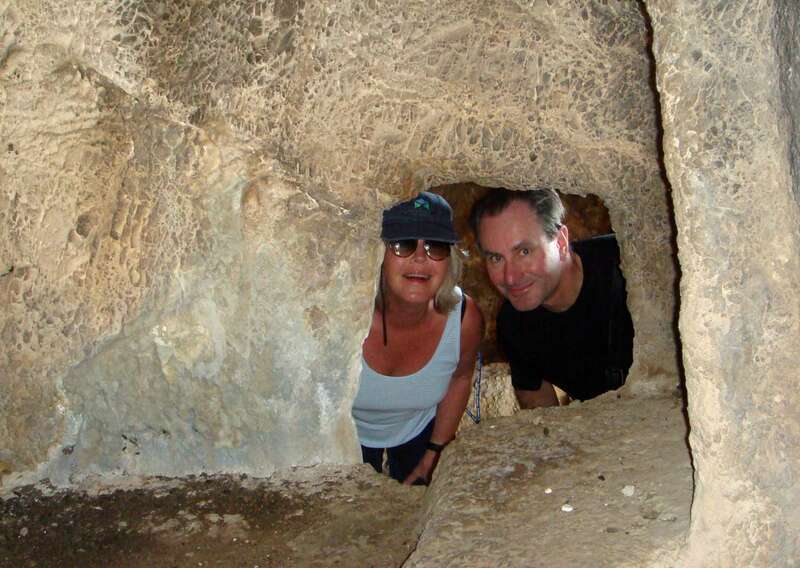 We book a day trip including the archaeological site of ancient Caunos and past the cliff tombs up to Dalyan village, but are not interested in the sulphury mud baths further upriver. We are only two of us, so the price of around 100€ seems expensive; anyhow, it is a long trip, the captain is friendly, and there is no time pressure on us. We start at around 9am to avoid the heat at the archaeological site. 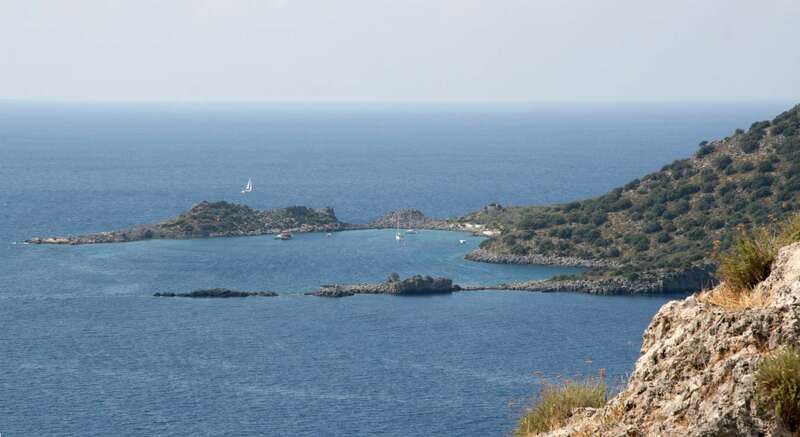 Passing small Delikada Island confirms that there is no safe and easy anchorage for private yachts. The pontoon is only used by large trip boats and gulets. The entrance to the Dalyan river, next to the 'turtle' beach, is so shallow, it can only be safely passed by local boats or by dinghy. Anyhow, we do not spot any private craft anywhere inside the entrance. TURTLE BEACH, A TOURIST ATTRACTION. 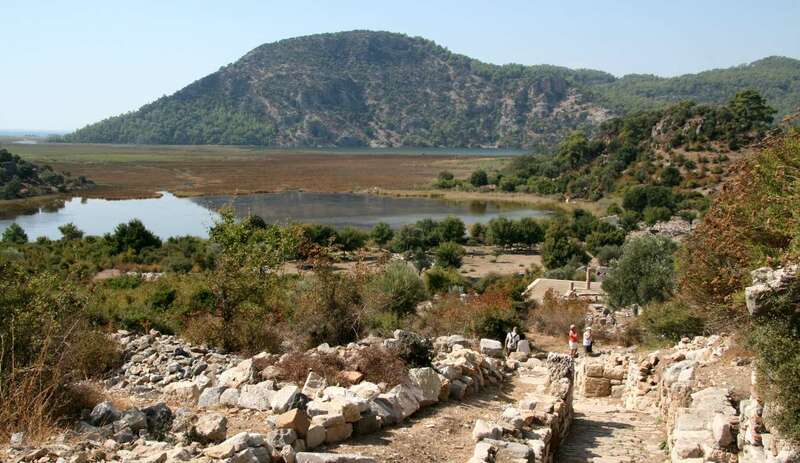 THE SHALLOW ENTRANCE TO THE DALYAN RIVER IS TO THE LEFT. 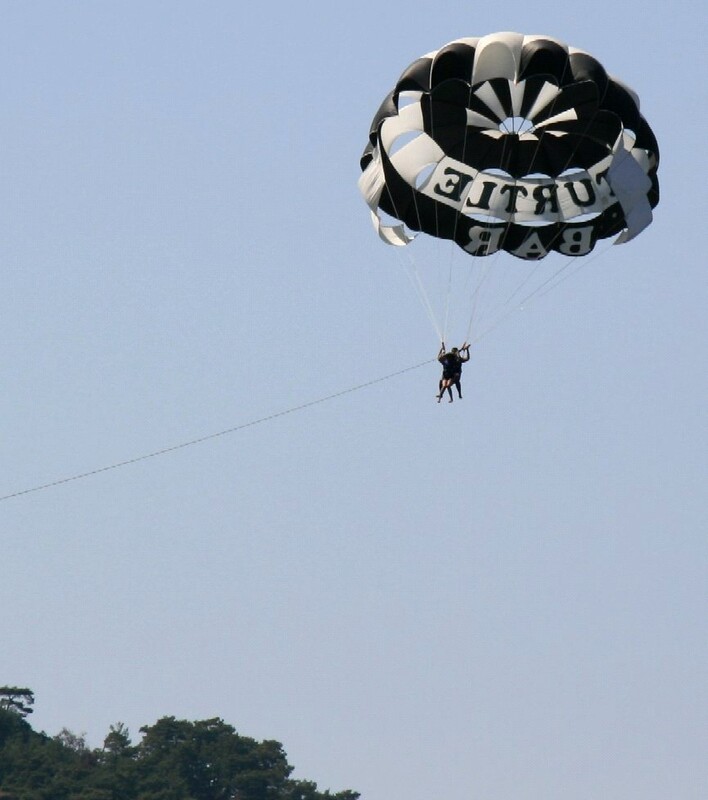 is helped by the fact that the site is surrounded by unspoilt nature. 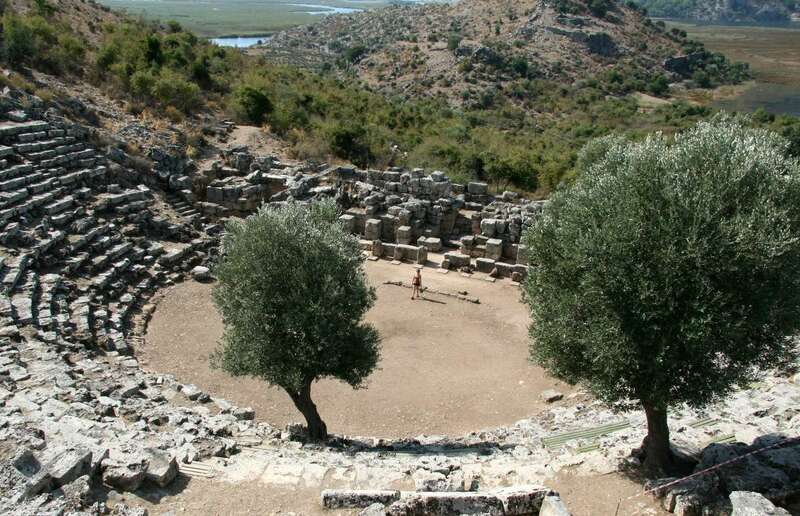 RUINS OF ANCIENT CAUNOS, THE THEATRE. THE DALYAN RIVER IN THE BACKGROUND. THE PORT (NOW SILTED) TO THE RIGHT. RUINS OF ANCIENT CAUNOS. MAIN ROAD TO AGORA, AND PORT. RIVER BASIN AND THE SEA IN THE DISTANCE. 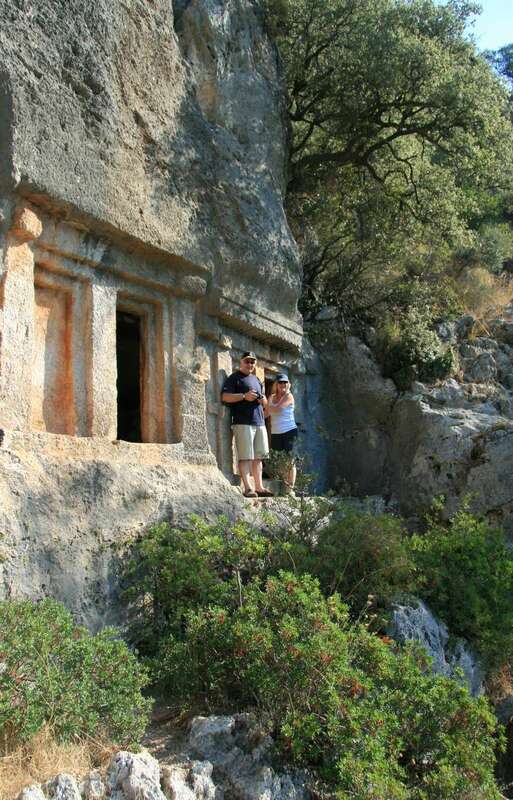 We continuer the river trip through marshes towards Dalyan village and the Lycian rock tombs. The captain takes us to a riverside restaurant he knows; a visit seems obligatory, but it's lunch time anyway and we need refreshments after the sightseeing. 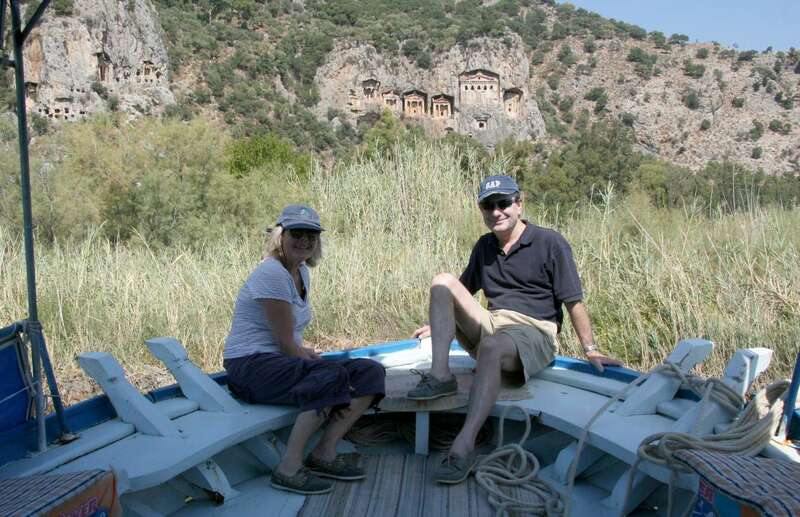 Dalyan village is worth a visit for the views to the rock tombs across the river. It has however been absorbed by mainstream tourism and thus is not very attractive to us. In the afternoon our taxi boat takes us back through the maze of river marshes; on the final passage between Delikada island and Mymarina the usual day wind gets up and increases the sea state. Despite all points of critique, we find the tour unique and are glad to have done it. We leave Mymarina in the morning and make our way towards the bay of Fethye. 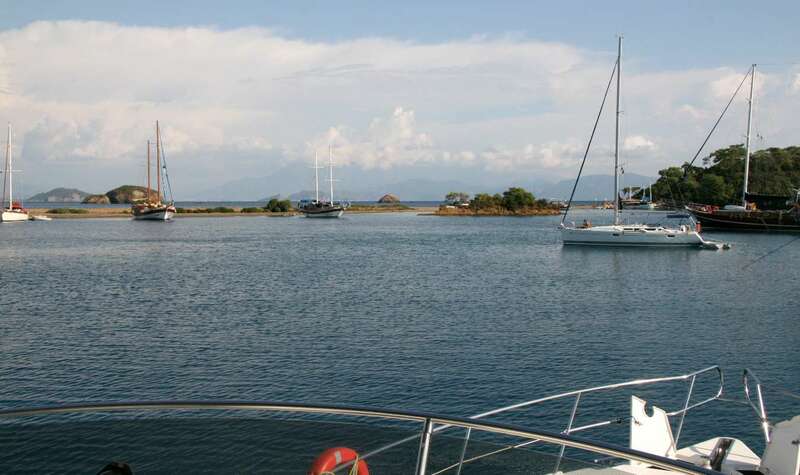 Along the passage, there is a possibility to detour and anchor at Baba island, in front of Sarigerme holiday resort. Being on a fast boat, however, we decide to go directly to one of beautiful coves in the Fethye bay area. We pass Kurdoglu point and try Kizilkuyruk cove. There are a few boats anchored but there is still more than enough space in this nice swimming cove. dodgy tree or lump of boulder (the tree variant is not well liked by locals I hear...). Purpose made metal mooring posts have recently emerged in some places, they help a lot. We are only anchoring here for a short stay - plus, we are short handed - so don't bother with a land line. Boating is not always safe around the rocky coves. A spooky reminder can be seen across, a brand new motor yacht has sunken at the tip of the cove. People are around in a dinghy and appear to evaluate the damage and take items off. The yacht might have hit a rock, or the anchor didn't hold. We do not spot any sign of fuel pollution from the accident, so feel it's safe to swim. 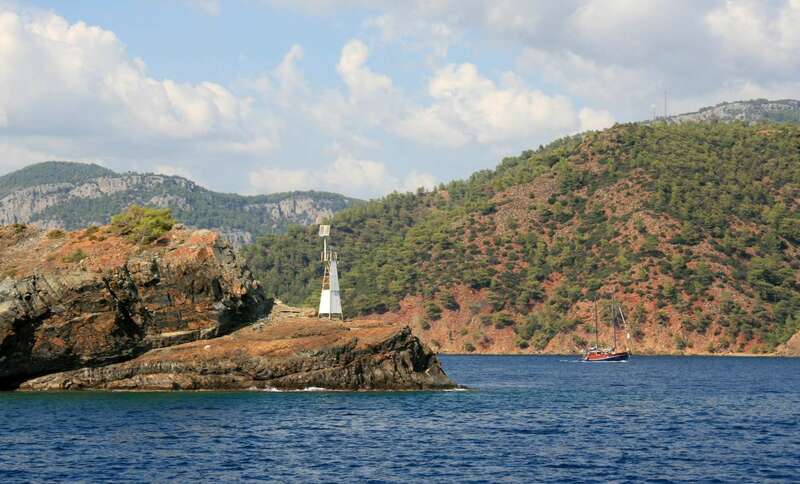 For the night, we go round the cape and enter Skopea Limani, the large bay South of Göcek with its numerous coves. The first cove we visit is picturesque Kapi Creek; we are offered an alongside berth on the inner side of the restaurant pontoon. We are amazed, when minutes later a catamaran gets squeezed in in front of us. Using every inch! Most of the yachts are sailing boats, apart from one very large American motor yacht. The sea is transparent and turquoise, reflecting the lush vegetation around; there are rocks and fragments of old walls in and under the water. It's a wonderful late afternoon and we go swimming straight from the boat's bathing platform. Swimming here is like in a heated swimming pool, only much better. Jane spots an old sea shell on the ground, in just 3m depth, and sets her ambition to dive for this "huge" treasure. Finally the trophy emerges, but turns out to be quite weathered and far smaller than it had appeared under water. Still a nice memory. After a walk around the cove we have a good dinner at the restaurant. 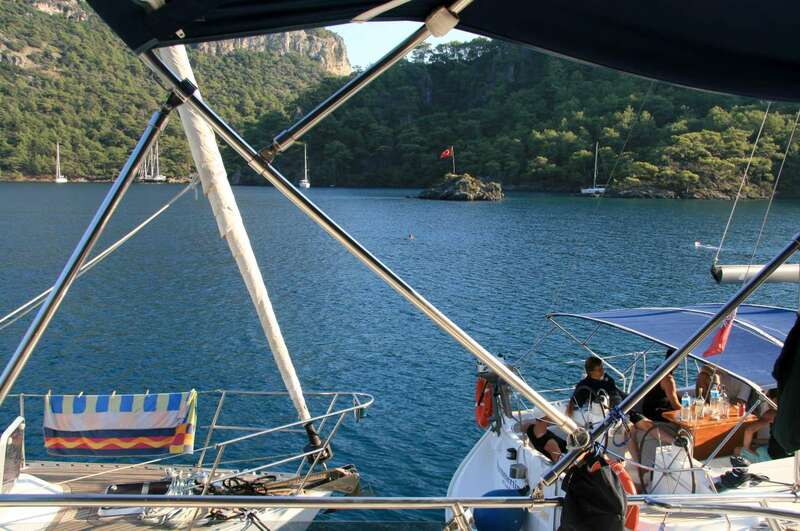 Our final target for today is Göcek, where we will choose a berth in a marina, to be joined by our friends Catherine and Sevket the following day. 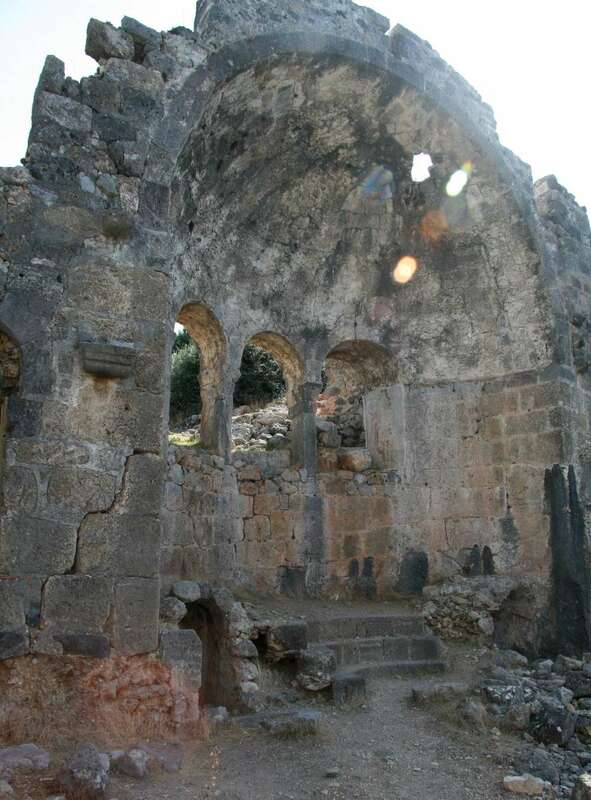 For the day we fancy visiting Gemiler Adasi (St Nicholas island), described as an ancient pilgrimage site with Byzantine ruins, to South of Fethye and the Karadag peninsula. The route leads along a craggy coast with rocky small islets (the Karakaören Büku). Guide books warn that the anchorage along Gemiler island is often crowded by gulets and trip boats, and difficult due to a rocky underwater ledge. We still try, right in front of the site entrance, and find that on this late morning there are hardly any boats. As soon as our intention to anchor is clear, helpers rush to us on a small boat and offer to take our landlines ashore (prepare 30m lines). In return we buy a pancake from mum who is preparing it on their boat, and offer the guy some tip. However helpful they are, remember you are a welcome guest, not an old friend. 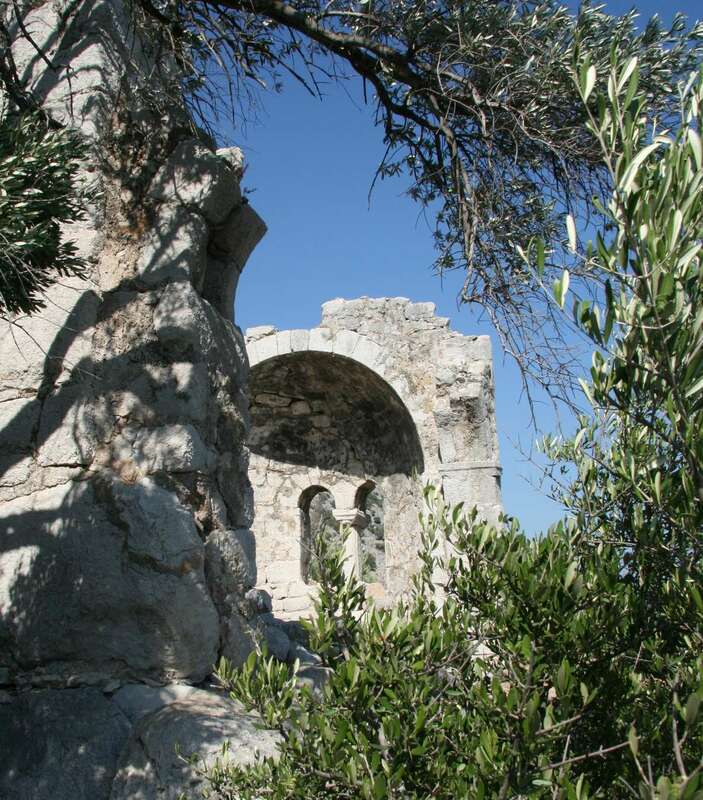 There is a small entrance fee to the island; the small longish island is steep and the path leads along a range of church ruins, with impressing views from the top. We have the site almost to ourselves; the location and views, its quietness, with some hovering clouds over the mountains on the mainland, create a memorable atmosphere. THE APSIS OF ONE OF THE BYZANTINE CHURCHES. THE ONCE FULLY COVERED STAIRWAY THAT LED ALL THE WAY UP TO THE TOP SANCTUARY. GERMILER CHANNEL. KIMBERLEY IS THE NEAREST BOAT. After our sunny and hot walk round the island, and relaxing with tea in the shadow of the small place at the entrance, we have an excellent swim and snorkel over the underwater walls of sunken buildings; then cast off lines. The clouds have come closer and, keen to stay in the sun rather than getting into a storm, I open the throttles and go round the peninsula and back to Göcek bay (by which time the clouds seem to have mostly disappeared..). Slow cruising around Tersane, Yassika Adasi islets and Göcek island, admiring craggy cliffs and nice coves, finally arriving at Göcek. We call Skopea marina and are advised which berth to take. Deciding to use the anchor, a small embarrassment ensues: Having put down the anchor and letting out chain going astern, the chain jams in the locker, obviously a stubborn pile and loop must have formed that needs toppling to untangle; I try but cannot get it loose just with the winch, and am stuck some 15m away from the pontoon. So, it's anchor up and starting again, this time using their mooring line. Later, I let out the whole chain to untangle it. 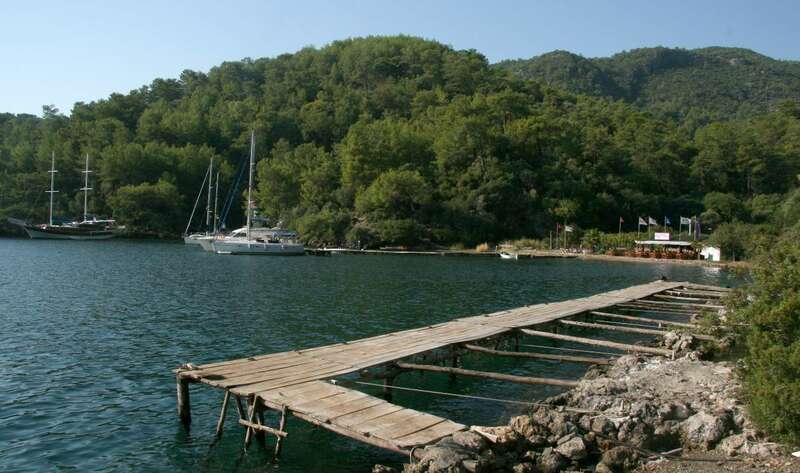 Göcek is a clean modern place, thoughtfully developed with no high rising concrete, and with four or five marinas and growing. We have a walk along the sea promenade with plenty of restaurants to choose from. Countless idle gulets are moored along the quays. If they all went out with customers in high season I imagine the coves must be crowded. With our friends on board, we set out to nearby Yassica Adalari anchorage. The anchorage in the N of the group of low lying tiny island, looks beautiful and seems very popular; we are carefully watching the depth and choose a space, but on first attempt the anchor does not hold well. We look for a better position and anchor again. With Sevket, as second guy on board, who swims ashore with a landline, the manoeuvre is much easier. For the night we choose to go to Tomb Bay (Bedri Rahmi Koyu). Restaurant Nomand is relatively quiet and we easily find a berth on their jetty. 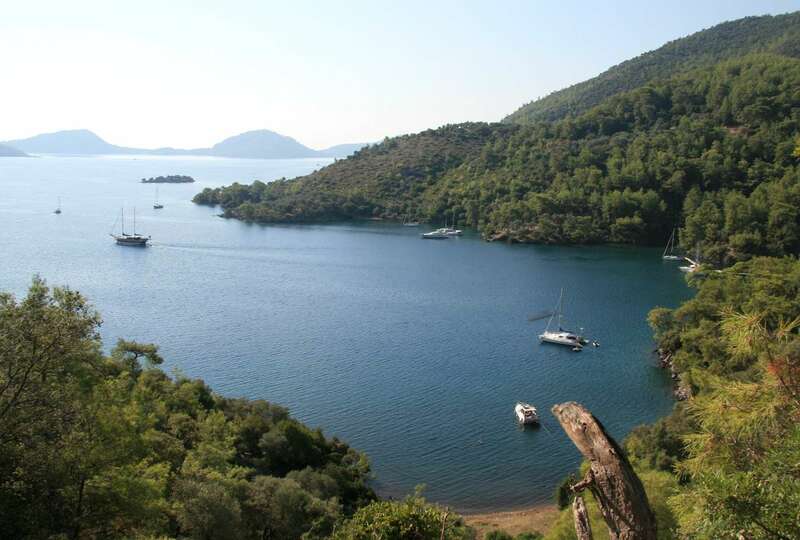 We notice a drop in temperature compared to Göcek, maybe because the cove is facing East so has no evening sun. 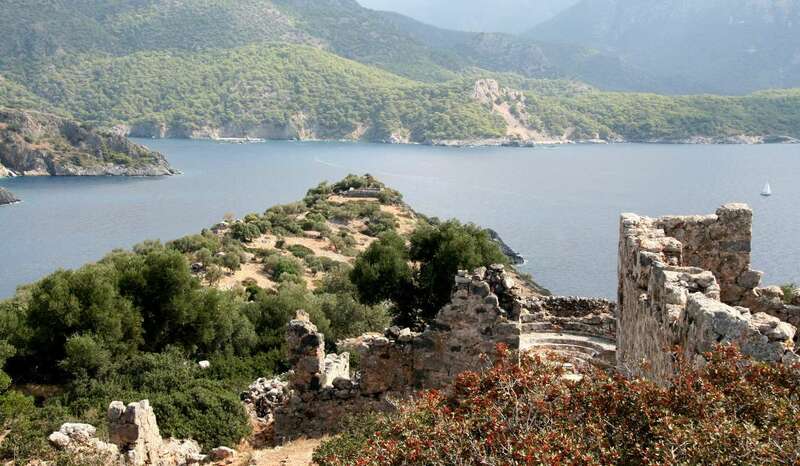 The cove is a scenic place and has its name after a couple of Lycian rock tombs in the cliffs on its N shore, which can be seen from the cove. 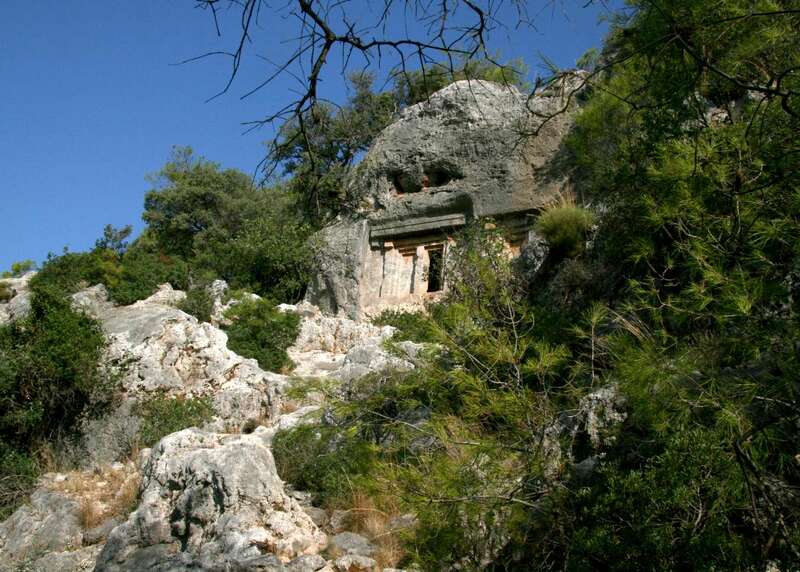 After breakfast at Nomad's we make a nice walk to the tombs, leading through unspoilt nature. Of course, the tombs are empty shells, but worth visiting, if for nothing else than for their dramatic setting and beautiful views over the bay. From Tomb bay we venture on to S and have a look at Sarsala Isk and Manastir Koyu, and decide to go to Wall Bay, where we find an inviting restaurant with a long jetty. We moor alongside. Taking out the dinghy we venture over to Ruin Bay (Hamam Koyu), named after its half submerged ancient ruins called Cleopatra's bath. It is a magical setting under pine tress, and we swim around the ruins. The restaurant, that in 2006 was reported to be here, has disappeared. Gulets anchor off the shore E of the baths' ruins. We have good dinner at the Wall Bay restaurant. It's our last day at sea, and we need to get back to Marmaris. The wind forecast has been for stronger winds with an increase in the afternoon. Given my experience of afternoon winds even without warnings, I want to get out early and across nearer to Marmaris by noon to ensure a comfortable passage. When we asked in the evening, we were told that breakfast and fresh bread would be no problem at 9am, but the staff in the morning has different ideas of timing. After a considerable wait we are finally served, and shortly later leave the cove. Thankfully, the weather forecast is proven wrong. Our passage is in calm seas and fast. 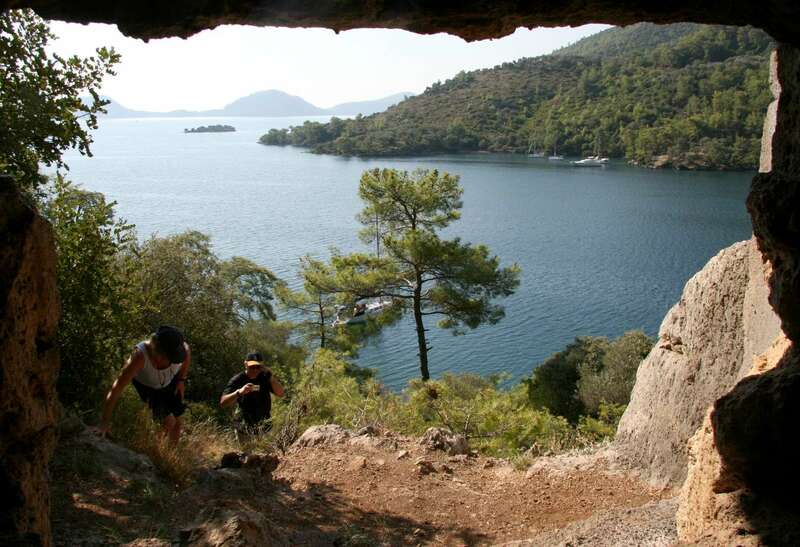 Being early in the Marmaris area, we decide to explore another cove. 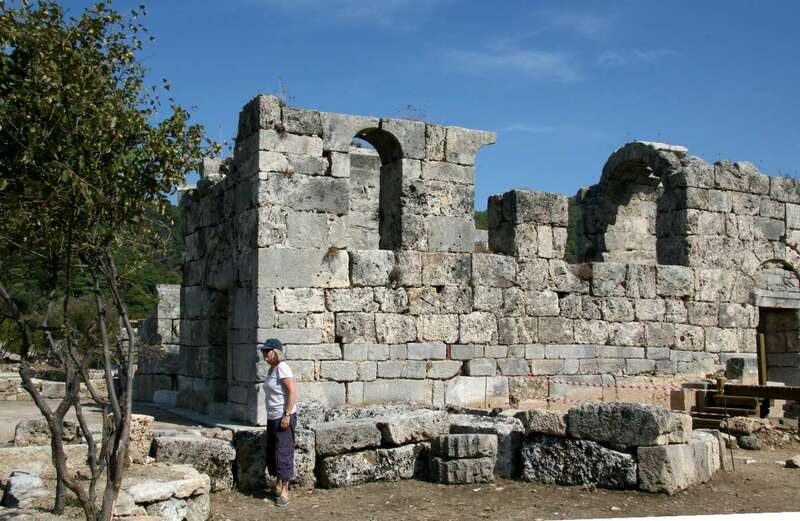 The Gerbekse Cove (Ince Creek, Byzantine Creek), near Ciftlik cove, S of Kadirga peninsula, is a safe anchorage, yet again with some historic ruins, including a Byzantine church. 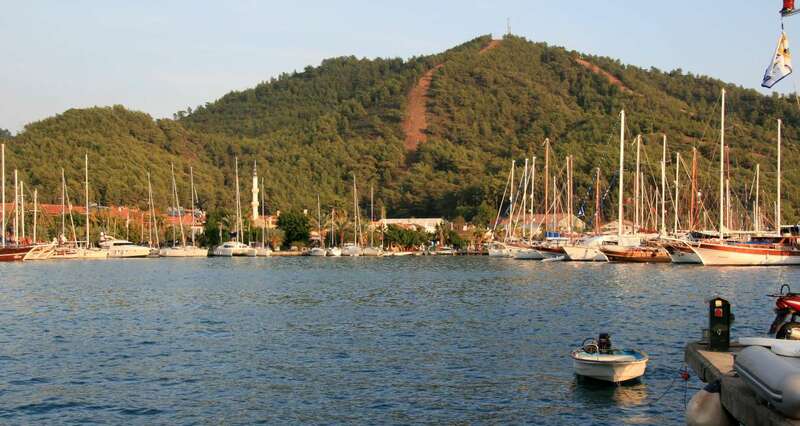 It is visited by trip boats from Marmaris, which anchor off the beach on its end. There is enough room to anchor elsewhere. We have lunch and swim; I make the short walk to the ruins and find nice views. From here it's a short trip back to Marmaris where we arrive in time for our friends to catch their bus. The obligatory visit to the fuel pontoon ensues. This time there is a bit of a wait due to a queue of sailing boats. 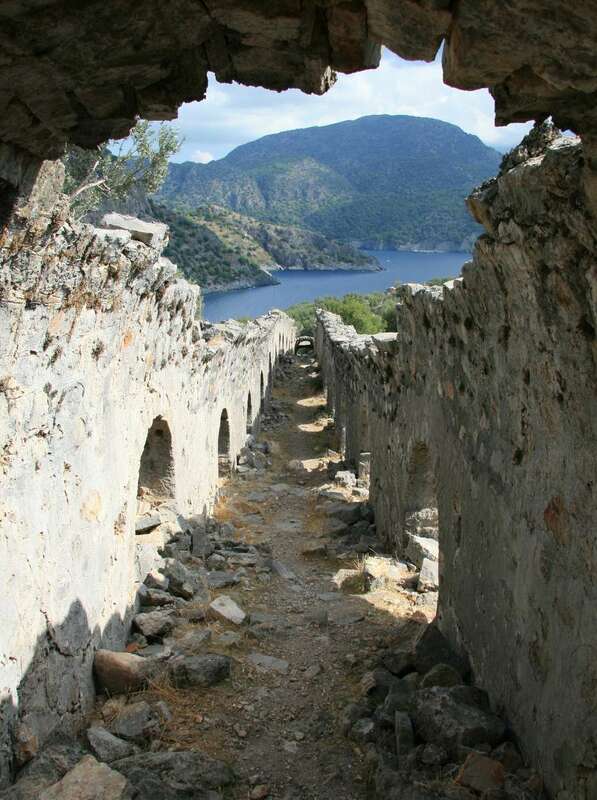 We spend the day as tourists in Marmaris, visiting the fortress and walking around Old Town and Quays. This concludes a week of almost perfect cruising, in beautiful nature and with the best possible weather, balmy clean waters, picturesque ancient sites, and tasty cuisine. I do not speak Turkish and find the names of places sometimes confusing; I am generally using those in Heikell's Turkish Waters Pilot. There are local names which are not in the guide, and differences in translations. E.g. Tomb bay is called Quellenbucht (Spring cove) in a German log. Kizilkuyruk bay is called Drachenbucht (Dragon cove) in the same log. 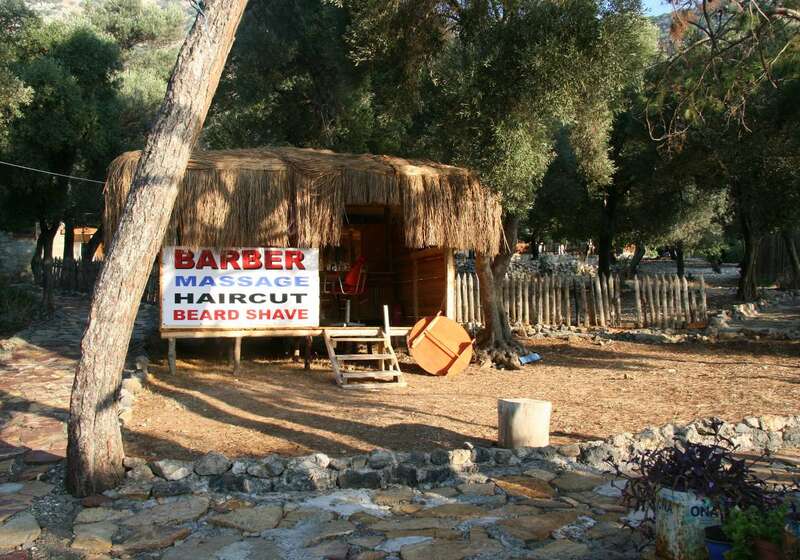 As a guidance, do not rely strictly on descriptions of small restaurants in coves, they change rapidly. Within Skopea Limani there is much choice, and distances are small, so you can always try the "next bay". In narrow spaces, in case of side winds, in case you are short handed, the manoeuvre can be tricky. Not to forget the issue of finding secure fixing points ashore, given the scarceness of mooring posts. Anyhow, near restaurants the owners will help with anchoring. In other popular places locals will come along with boats who sell bread, pan cakes, or merchandise etc and offer help.